Vada's Blog Stamp Inks and Paper : GC. #76 Color Challenge; is Pumpkin, Eggplant, and Avocado. GC. 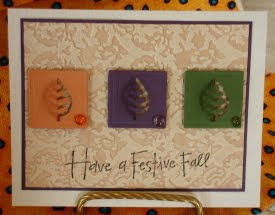 #76 Color Challenge; is Pumpkin, Eggplant, and Avocado. 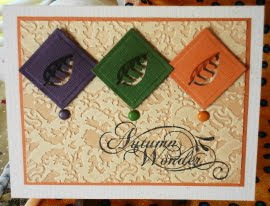 Gingersnaps Creations Color Challenge # 76 is Pumpkin, Eggplant, and Avocado. These are truly some rich fall colors that excites the taste buds and delight the eyes. Therefore, I encourage you to join us in this challenge. I’m adding three little note cards for this challenge. 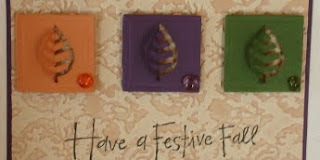 They are very simple (repeating) cards, that use the same punch, glass beads and brads, embossing folders. My embossing folders are from Sizzix, punch is from E K Success and stamps are from TAC, Impression Obsessions and Great Impressions. Can’t wait to see your creations for this challenge. Labels: Gingersnap Creations Challenge, Great Impressions., Impression Obsessions, TAC. Vada, I love these! 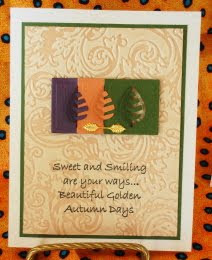 You did a fabulous job with the colors and the embossed backgrounds add to the richness! Vada, these are stunning cards. I know I already commented on your card but wanted to Thank you for entering my giveaway and wish you the best of luck! A gorgeous trio of cards! Thanks for playing the challenge.